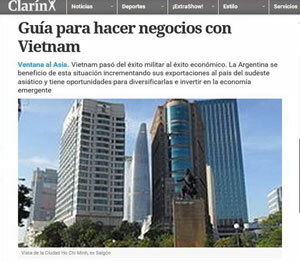 Argentina newspaper ‘Clarin’ on May 27 run an article, praising Vietnam’s economic achievements in recent years and economic and trade cooperation opportunities with the country. The author, Julio Sevares – an economist and professor from Buenos Aires University – analysed advantages and challenges for Argentinean businesses to invest in Vietnam. 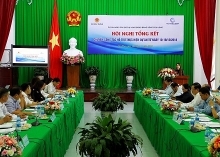 The article reviewed Vietnam’s renewal process, emphasising that since the year 2000, the country has seen an annual economic growth of 6.5% while per capita income jumped five fold. GDP grew 5.8% last year and is expected to reach 6% this year. Vietnam has accelerated tax, custom and investment reform to attract investment from the private sector. 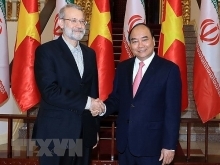 Currently, the Vietnamese Government has paid more attention to developing the production sectors with high added value like the software industry, it said. Vietnam has become an attractive market for many countries, including Argentina. In the 2002-2014 period, the bilateral trade value increased 20 fold to hit a record high of US$1.7 billion last year. The economist underscored that besides advantages, Argentinean investors will face a number of challenges when doing business in the country due to cultural differences and increasingly fierce competition. Vietnam businesses have applied state-of-the-art technologies and market economic principles to production to improve their products’ quality to compete with imported goods. Free trade agreements signed between Vietnam or other Asian countries with Chile, Australia and New Zealand also pose a challenge to Argentinean business activities in the region. The article concluded that Vietnam provides huge opportunities for Argentina, however, fierce competition requires both public and private businesses from the country to develop proper development strategies with a long-term vision.